Sound Transit is celebrating an incredible milestone! Contractors are halfway done with construction of the East Link light rail extension. 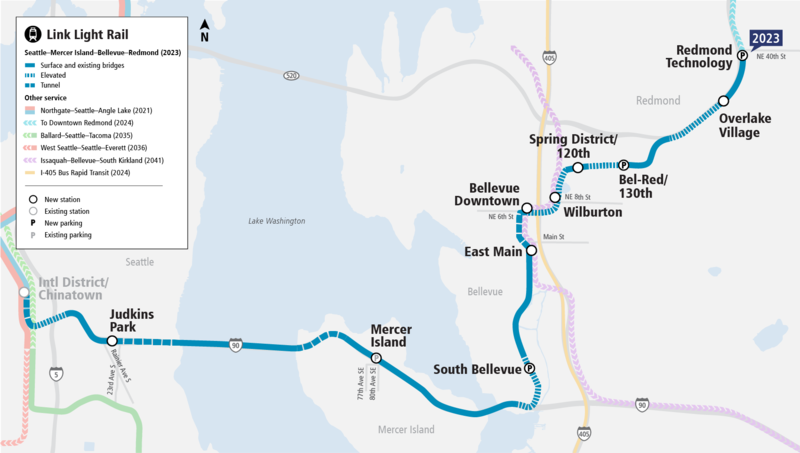 The East Link extension will become the “Blue Line” when we open for service in 2023. People will notice that some stations and trackways look complete and ready to service, but all 14-miles and 10 stations of the “Blue Line” will open all at once in 2023, after testing and pre-revenue service. Construction broke ground in April of 2016, and anyone who has traveled through neighborhoods in south Bellevue, the eastern edges of downtown Bellevue, the up and coming spring district or even in the center of I-90 between Mercer Island and Seattle can see the progress and how much this project has taken shape. Coming this year, some of the larger pieces of light rail trackways will be complete, including all of the aerial guideway in Bel-Red, south Bellevue and out to Redmond along SR-520. In South Bellevue, the aerial guideway will be complete in late-Fall, connecting the structure from the East Channel Bridge, over I-90 and onto Bellevue Way. Traffic changes will occur on Bellevue Way and 112th Avenue SE as work continues to change and finish. In the completed downtown Bellevue tunnel, concrete work and the installation of the waterproof lining continues, including pouring the floor of the tunnel in which track will be laid later his year. East Main, Bellevue Downtown, Wilburton, and 120th/Spring District Stations are all in various stages of construction, with most taking shape by the end of the year. Bel-Red/130th Station’s construction activities over the last year have largely focused on aerial guideway construction and building or updating underground utility systems. Over the next year, contractor crews will complete the remaining underground utility systems to make way for sidewalk, landscaping and lighting construction. Crews will also complete the bridge structure and begin constructing the Bel-Red/130th Station. Light rail tracks have been installed on Mercer Island between Mercer Island Station and the East Channel Bridge, track will begin to be installed on the I-90 floating bridge later this spring. Judkins Park Station continues to make progress with station walls, elevator shafts and foundations for the entrances at Rainier Ave. In April, work will begin in the International District / Chinatown Station to prepare for the connection of East Link to the main light rail line in Seattle. The guideway, noise barriers, two station platforms, and a 350 stall parking garage are clearly taking shape in the Overlake neighborhood. In the coming months crews will continue work to span SR 520 with a pedestrian bridge connecting the Overlake Village Station to the SR 520 Trail, pouring concrete for the bridge spanning NE 140th and NE 148th streets, and building the Redmond Technology Station garage to its full height. We’re enjoying seeing this project come to life!